We get it Mr Varma, we get it. Those who live by the gun, die by it. Crime does not pay. Young men who come to the city to make a living often become embroiled with the underworld and end up working for it. Crime does not die, it just returns in new forms. Every criminal will have a love story with a pretty girl, will take her out to see the city they live in at least once and the duo will eat street food while throwing sly glances at each other. We get it Mr Varma, we get it. What we don't get is your morbid fascination with the world of organized crime. You've told us the same story a zillion times so far with a zillion different faces. Any sane observer of your work knows that you can do this brilliantly (Satya, Company) or go torridly wrong with it (Department). We also know that you've tended to go wrong more often (or should we say all the time) in the last few years. Why then, don't you take a break? Why then, don't you knock back some Vodka (your poison of choice as per your rants on Twitter) and take a long hard look at where you're headed? Why then, do you insist on giving us sub-par products that make us yearn for the Ramu of yore? We could go on and on, but we do have a movie to review, so we'll get that out of the way. Satya-2 is about Satya (Sharwanand), a young man who comes to Hyderabad. He joins a construction magnate (Mahesh Thakur) and helps him improve his business by bumping off his rivals and a police officer supporting his rivals. He receives an outstanding on his performance appraisal for thinking out of the box and is immediately introduced to other business magnates who require similar services. After he thinks out of the box and does tasks for all of them, he announces that he is going to float his own company for which he will require unlimited funds. He also announces that no one will ever know about the functioning, structure or methods of this company except him. The business magnates promptly agree and invest untold amounts of money into this new Company that is given the absolutely original name 'Company'. Satya kills an industrialist, a media baron, the police commissioner and a special investigative officer assigned to investigate his case and his company becomes an overnight sensation that makes trillions of money. He starts making bigger plans and establishes a company that starts assuming the proportions of a parallel government. How Satya meets his match in the police department forms the rest of the story. The film has an open ending and throws broad hints at a couple more sequels (god forbid). Added to this crime saga are a couple more tracks - Satya's love story with Chitra (Anaika Soti) and his friendship with Ganesh. Ganesh also has a girlfriend named Special (Anuradha Gupta). Special keeps hinting about a backstory as to why she got the name Special but never actually tells us the story. The main problem with Satya 2 is that large stretches of the film run on a terrible to hear narration by Ram Gopal Varma. We never see the impact that the Company has on anyone, only hear about it in narrations. Ramu exhorts us to believe that the Company has grown bigger than the system, but the way the cops pick off on Satya and his associates, it hardly seems to have grown to the status of a gang of extortionists. RGV also keeps cutting away for songs and duets. One of these is shot in Kashmir and is sung by RGV in a voice terrible enough to awaken Kumbhakarna from his epic slumber. The actors are miscast. Sharwanand makes a fair attempt but is hampered by a terrible hairstyle. Anaika Soti looks bad, dresses terribly and if she is RGV's latest muse, then god save us. Anuradha Gupta is the only one amongst the lot that manages a modicum of performance. The film is shot in Hindi with only Sharwanand's part shot separately. All the characters, therefore, speak in Hindi. The music is terrible and the background score is ear splitting. RGV's favourite rogue camera technique is thankfully not used, but his camera angles and placements remain the same. Satya-2 is further proof that in his attempt to be different, RGV is doing the same things over and over again. Watch Satya or any of RGV's good works again instead of heading to this one. fullhyd.com has 700,000+ monthly visits. 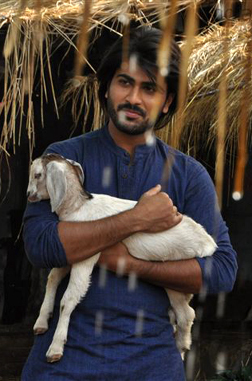 Tell Hyderabad what you feel about Satya 2 (Telugu)!